Last Tuesday the Magistrates' Court Amendment (Mental Health List) Bill 2009 was introduced into the Victorian Parliament. The Bill proposes to amend the Magistrates' Court Act 1989 and set up a Mental Health List within the Magistrates' Court of Victoria as a three-year pilot project. Approximately three hundred candidates will undergo rehabilitation and treatment under the supervision of the Court instead of entering a plea. (e) a neurological impairment, including, but not limited to dementia. 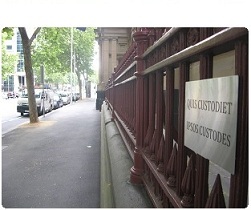 (h) other services that aim to reduce the risk of offending or re-offending. If it is satisfied that they have successfully completed the treatment it has directed the court has the discretion to discharge the accused without making a finding of guilt against them. The process can be described as a kind of hybrid between the existing court processes of deferral and diversion. (b) indicates an intention to plead not guilty. So an accused who wishes to assert their innocence, including putting forward a claim of mental impairment, would not be eligible to participate. An accused person who is charged with an offence classified as a sexual or serious violent offence by the Sentencing Act 1991 would also not be considered. Other than this, and the restrictions at 4T, the legislation seems designed to make admission as flexible as possible.